SHANGHAI (AP) Justin Rose was down to his last couple of events when he rallied from eight shots behind at the HSBC Champions to keep alive an important streak. This is his eighth consecutive year with at least one victory. His streak on the PGA Tour ended last year, though Rose counts the gold medal he won in the Olympics. Rose had three runner-up finishes this year, including a playoff loss to Sergio Garcia in the Masters. The others were the Sony Open and BMW Championship, though he was not in serious contention in either. He finished seven behind Justin Thomas in Hawaii and five behind Marc Leishman in Chicago. Rose still has the Turkish Airlines Open and the DP World Tour Championship in Dubai before heading home to the Bahamas for the Hero World Challenge. His next goal is multiple victories in a season. He has won twice in 2010, 2014 and 2015 while playing the PGA Tour and European Tour. He has taken note of Thomas, Dustin Johnson, Jordan Spieth, Jason Day and Hideki Matsuyama each winning at least three times dating to 2015. THE 500 CLUB: With little fanfare, Charles Howell III made his 500th career start on the PGA Tour last week in the HSBC Champions. He was surprised by the milestone, and where it took place. Howell left for what he thought was a two-week swing through Asia when enough players chose not to go to Shanghai that Howell got in as an alternate. The problem was he didn’t have a visa, so Howell and Chez Reavie spent nearly two days in Hong Kong waiting for it to come through. He got the visa and tied for 15th. Howell said he was shocked when he realized he had played 500 tournaments, including two times he played as an amateur. He removed his cap to show flecks of gray in his hair and laughed. HAPPY TRAILS TO TORREY: Pat Perez has played Torrey Pines, the course where he grew up on in San Diego, every year since his rookie season. He has contended twice in the last four years. Adding to the occasion is that his father, Tony, is the starter on the first tee. But if he wants to announce his son teeing off, Tony Perez will have to be in Dubai. With two victories in the last year and at No. 18 in the world, Perez is ready to travel. His plan is to play in the Singapore Open the third week of January, and the following week – opposite the Farmers Insurance Open – he’ll be at the Dubai Desert Classic. And to think that just eight years ago, Perez referred to himself as ”globally unknown” when he was at the HSBC Champions. This year, he not only had an autograph request, one Chinese fan asked for a selfie. And he’s going to Singapore. 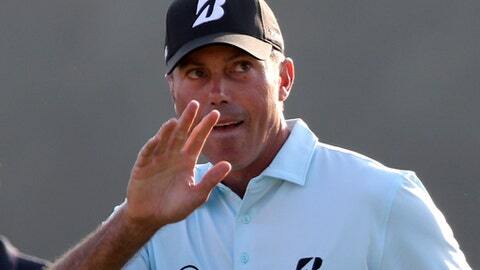 KUCHAR’S LOSS: Matt Kuchar is tough to beat in table tennis, at least at the Ryder Cup and Presidents Cup. Most amusing about this 11-point match was not that Kuchar lost, but that he didn’t know the 20-year-old he played. He figured he lost to a Chinese teenager until told that Dou – known as Marty Dou in America – is a fellow PGA Tour member. CANTLAY’S PROGRESS: Being gone from golf for nearly four years because of a severe back injury makes it hard for Patrick Cantlay to compare anything with the past, and that goes for his physical condition. One thing is clear: He returned this year bigger and stronger, which has been more about filling out than bulking up. Out of golf since 2013, he had a remarkable return. He didn’t miss a cut and made it to the Tour Championship while playing on 12 events. Part of that was due to an ankle injury that slowed him for two months, but as for his back, he has no limitations. These two weeks are an example of that. He flew to Shanghai for the HSBC Champions with no issues, despite spending so much time in a plane. He also decided to play this week in Las Vegas after another trans-Pacific flight. DIVOTS: PGA Tour Commissioner Jay Monahan says there will not be an increase in the amount of FedEx Cup bonus money this year, the first under the new contract with FedEx. He said the ”impact” of the new contract likely will be visible in 2018-19 with the overhaul in the schedule. … Ricky Elliott, the caddie for U.S. Open champion Brooks Koepka, was voted HSBC Caddie of the Year last week in Shanghai. The previous caddie of the year, Austin Johnson, was voted best dressed. … Jason Day fell to No. 11 this week, his first time out of the top 10 since the week before the won the Match Play Championship in February 2014. … Dou Zecheng goes by `Marty Dou” when he plays in America, and it wasn’t a name he picked randomly. Dou said when he went to elementary school in Canada, that’s what his teacher called him. … Mark Newell has been nominated as president of the USGA. Three-time major champion Nick Price has been nominated to serve on the executive committee. STAT OF THE WEEK: The average world ranking of the four opposite-field event winners on the PGA Tour this year was 378.5. FINAL WORD: ”I’d pull my hair out if I had any.” – Bill Haas after a 76 in the third round of the HSBC Champions.